Inulin is an indigestible carbohydrate, a polysaccharide made of 20 to several thousands fructose molecules with a glucose molecule on the end. Inulin belongs to fructans. It is a soluble fiber. Inulin cannot be digested and absorbed in the small intestine, so it passes to the large intestine where it is broken down (fermented) by beneficial colonic bacteria into gases and short-chain fatty acids (SCFAs) and can provide 1.-2.1 kilocalories per gram [1,2,3,4-p.387]. 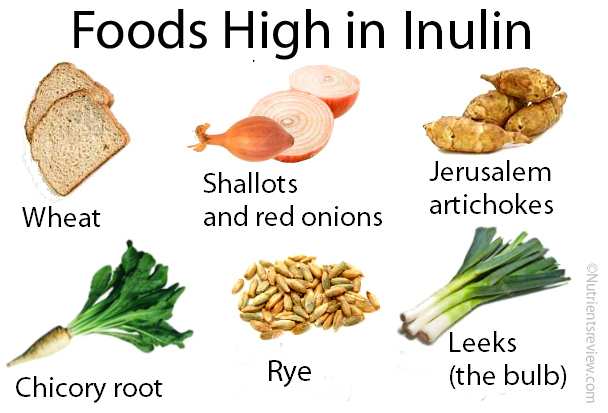 Foods naturally rich in inulin include wheat, onions, shallots, Jerusalem artichokes, chicory root, leeks, asparagus and rye. Other foods containing inulin: agave, custard apple, mango, peach, persimmon, rambutan, watermelon, zucchini, bananas [5,6,7]. Inulin can be added as a fat replacer or fiber to candies, biscuits, cakes, cookies, crackers, frozen dairy desserts, chocolate, ready-to-eat cereals, jams, jellies, reduced-fat milk and soups . Inulin and oligofructose enriched inulin supplements are available as capsules and chewable tablets. Constipation. In one study, agave inulin in a dose 5-7.5 grams increased the frequency of bowel movements but also increased abdominal bloating and gas , so inulin supplements may not be optimal treatment for constipation. Weight loss. In one study in obese Mexican women, adding 5 grams of inulin to meals for 3 months had no effect on weight , but according to one systematic review of studies, long-term inulin supplementation may contribute to weight reduction . Travelers diarrhea. In one study, inulin in a dose 10 g/day for 2 weeks prior to travel and 2 weeks during travel to countries with increased risk of traveler diarrhea, decreased frequency and severity of diarrhea . Diabetes mellitus. In one study, inulin lowered fasting glucose level and glucose spikes after carbohydrate meals . In another study, consumption of inulin for 14 days resulted in decreased fasting blood glucose levels in diabetic individuals [1,4-p.389]. Cholesterol levels. In some studies, inulin lowered the total and LDL cholesterol  and blood triglyceride levels , but in others did not, so more research is warranted [1,4-p.389]. Calcium absorption. Inulin may increase calcium absorption but eventual health benefits of this are not known [1,4-p.389]. Inulin acts a a prebiotic – ingestion of 15 grams inulin per day can stimulate the growth of beneficial intestinal bacteria, especially Bifidobacteria [1,4-p.389;8,11]. The actual health benefits of prebiotics in humans are not clear yet. Inulin is Generally Recognized As Safe (GRAS) by the US Food and Drug Administration (FDA) . Pregnancy. Do not take inulin supplements during pregnancy or breastfeeding since not enough studies were done to evaluate its safety during these periods . If ingested in amounts greater than 20 grams per day, inulin may cause abdominal bloating, cramps or pain, excessive gas (flatulence), loose stools or diarrhea [4-p-391;8], especially in individuals with fructose malabsorption or irritable bowel syndrome (IBS). Fructans might promote dental caries .